← Cowboy Breakfast is Back! 1st Sunday Each Month! 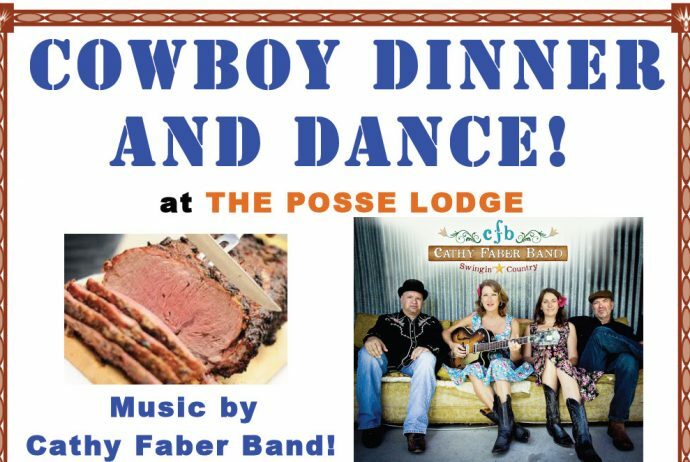 Cowboy Dinner and Dance after the Rodeo Aug 13! Menu: Steve Wallin’s BBQ! Prime Rib, Salmon, Brats, Coleslaw, Cowboy Beans, Bread and Dessert. Hotdog plate for the kids. Music and Dance: Cathy Faber Band will be playing from 7:00 to 10:00 pm. Cathy has rocked the Lodge before with her Swingin’ Country Band. Dance to Roots Country, Western Swing, and Rockabilly! Cost: $15 Adult Dinner. $10 Dance. Children 10 and under only $4.